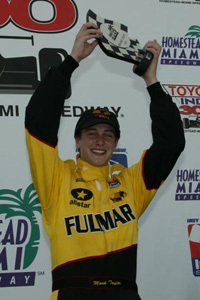 HOMESTEAD, Fla., Sunday, March 2, 2003 – Mark Taylor won the Western Union 100 in his first IRL Infiniti Pro Series start on March 2, 2003 continuing Panther Racing’s mastery of Homestead-Miami Speedway. Taylor, from London, beat rookie pole sitter Thiago Medeiros to the finish by 1.2860 seconds. He averaged 134.257 mph for the victory in the No. 4 Fulmar Panther Dallara. Brandon Erwin finished third in the No. 99 Natural Golf/Sam Schmidt Motorsports entry. The victory continued Panther Racing’s perfect mastery of Indy Racing League events at the 1.5-mile Homestead-Miami track. Sam Hornish Jr. won the IRL IndyCar? Series events at the track for Panther in 2001 and 2002, while Taylor opened Panther’s first Infiniti Pro Series season with a victory. “I can’t believe I’ve won the first race,” Taylor said. “It’s my first race on an oval, first win on an oval. I can’t say much more than that. The Panther guys did a great job. The car was so good. I was just happy to finish the 67 laps, and most of them in the lead. Taylor, who started second, took the lead for good on Lap 35 of the 67-lap race. Jeff Simmons led Taylor by approximately a second when Simmons’ No. 20 Western Union Speed Team/Duesenberg Dallara spun into the grassy apron adjacent to Turn 2 while racing in traffic, eliminating him from the race. “The lap before going into (Turns) 1 and 2, I picked up a little bit of understeer behind, I believe, the No. 24 (Paul Dana),” Simmons said. “I was hoping he was going to make way because we were about to lap him. He didn’t in (Turn) 3 and 4. Then I picked up a big understeer again. Taylor then fended off Arie Luyendyk Jr. and Medeiros over the final 32 laps for victory. He led 56 of the 67 laps overall. Luyendyk ended up fourth in the No. 5 Sinden Racing Service entry, with rookie Jonathan Urlin rounding out the top five in the No. 33 Budget Rent A Car Dallara/Infiniti/Firestone.